While Nintendo’s premium and paid “Nintendo Switch Online” service was delayed a year after the console’s worldwide debut in March of last year, we still don’t really know much about the new paid online component, and what to expect. After playing with the Switch for nearly a year, I’ve come up with a list of features their new online suite desperately needs for them to be competitive in the current hardware generation with the PlayStation Network and Steam dominating the online multiplayer space. A more flexible user account system that doesn’t rely on dumb, draconian, Friend Codes. It would be preferable to simply let users register a username, something put into practice over twenty years ago, and let other users identify them as such and add them by their username. Currently you can only add people via Friend Codes or by meeting them in online games, or via existing Friends on the 3DS or the Wii U. This is unacceptable and so insanely backwards it actually hinders the growth of their online multiplayer, and their network. If they’re so afraid of kids running into users named “ExplodingLabiaMonster666” or something, offer Parental Controls that lock an account to Friend Codes only. An achievement or trophy like system. Love them or hate them, having more System-level features that Nintendo can tick off for games coming to their platform like achievements is only better for the marketability of the console itself, as well as its games. The more games released for the platform without some kind of system-level achievement system, the harder it becomes for Nintendo to make it a mandatory feature. They can simply take pages out of Sony or Microsoft’s book and require all retail-level games have achievements of some kind and a top-level cumulative achievement, while smaller, download only games can get by with a handful. Some kind of video streaming option that isn’t stupidly restricted for some reason (you can currently only record 30 seconds and upload it to social media) and is mandatory for all games to support, at a System-level (the current feature is also optional for developers). This should naturally tie into all of your video streaming options like YouTube, Twitch, Hitbox, and so on. This is a very hard sell because of how totalitarian Nintendo is with the streaming of their own games (they basically bend you over and gape you until you pay up royalties), so who knows how they would even implement such a feature, and how unfettered it would be. The current short video recording solution is optional for developers to support – this is stupid and we all know if there’s a System feature developers aren’t forced to support .. they probably won’t support it. Built in voice chat at the system level. The voice chat nonsense pushed with the mobile app is just that, nonsense, and I guarantee no one will use it over other options like Discord. What’s more, you can only use voice chat in the mobile app while the app is open – the entire time. So now you have to worry about both your Switch’s battery and your phone as well. The only way to be competitive is to offer voice chat as a built-in option for the system, and it should be ubiquitous with the system’s Friend list and related functionality. A party chat and or party system to encourage playing more games with friends. The current system will only let you add friends and stalk whatever games they’ve played or are playing on their page in your Friend List. That’s it. The current way of inviting friends requires sending an invite in game, accepting the invite via the Switch mobile app on your phone, and then and only then are you able to play together. This is so insanely draconian and makes absolutely no sense for a seamless and fun online experience. The Nintendo Switch mobile app needs to be relegated to simply a mobile companion app – something to manage your friends list, your achievements, progress of games, news blurbs and updates for said games, and more. This needs to be a clear distinction and the Switch’s online suite really needs to be presented as a premium service worthy of being charged an admission fee, with the functionality and features to back it up. Many fans are already pissed off over the mandatory fee, some are even swearing it off like others did when the PlayStation Network became a paid experience. 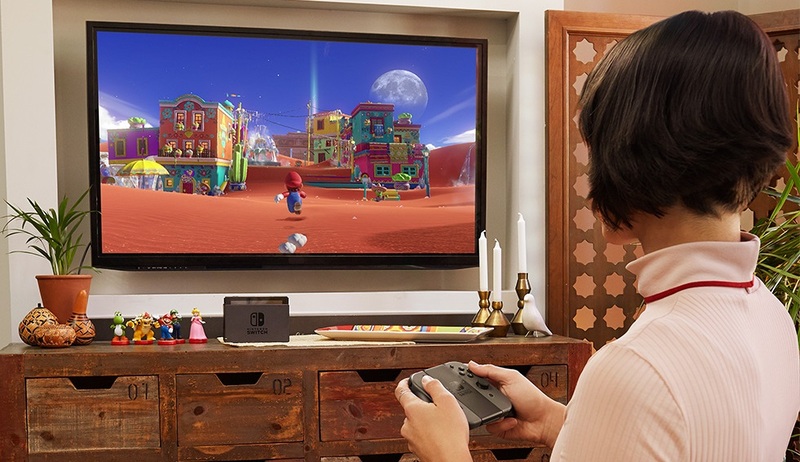 All in all, it was honestly depressing to see how bare-bones the Nintendo Switch’s online features and OS-level features were upon buying the console. It reminded me of how barren the PlayStation 3 operating system and feature set was upon launch – a nod to companies not knowing what to put in their hardware operating system. My biggest concern is that Nintendo is going to continue pushing their dumb mobile app with their paid online service and expect their legions of fans to lap it up, while other services will offer vastly more comprehensive and robust online experiences. Knowing the way in which Nintendo operates, they’re probably going to go their own route like they always have done in the past. Why should you pay for an online suite on a modern gaming console when it probably won’t have the same features as its competitors? My other concern is that Nintendo fans will simply lap it up, fork over their money, and Nintendo will get by with offering a lackluster online experience. Their official blurbs make it clear the Switch’s online will continue working with the mobile app. I want the Switch to have a great online component, but who knows if we’ll see it. It took Sony an entire hardware generation to finally get a competent online suit, so I’m concerned it might take Nintendo several (their previous outings with online functionality have been limited at best, subpar at worst). What do you want out of the Nintendo Switch’s online feature set? Are you ok with having to use a mobile companion app to get basic online multiplayer functionality? Sound off in the comments below!